This study assessed predictors for failure of en bloc resection and perforation in colorectal endoscopic submucosal dissection (ESD) by using features available before attempting ESD. Predictors for technical difficulty for different levels of expertise were also evaluated. In addition, a learning curve from rectal lesions to colonic lesions in different levels of experiences was focused on. We evaluated ESD outcomes in 716 lesions and the association between preoperative endoscopic findings and the unfavorable results. ESD for colorectal lesions is a promising technique for complete tumor removal and precise histological evaluation of resection margin and cancer-metastatic risk; however, ESD occasionally results in unfavorable outcomes due to significant technical difficulty. In general, treatments should be chosen on the basis of disease characteristics, possible treatment outcomes, and risks related to the treatment. Preoperative prediction of technical difficulty in colorectal ESD could help to accurately stratify lesions according to technical difficulty and to modify endoscopist or institution procedure which would improve ESD outcomes. Moreover, this may contribute to the choice of appropriate treatment methods with more balance between risks and benefits which would increase clinical benefits and the impact of endoscopic treatments over surgery for patients with large colorectal lesions. Macroscopic tumor types used in this study. A, Protruding lesion. B, Depressed lesion. C, Laterally spreading tumor, granular type. D, Laterally spreading tumor, nongranular type. E, Scar lesion. Multivariate analysis revealed that independent predictors of failure of en bloc resection or perforations were the presence of fold convergence, protruding type, poor endoscope operability, right-sided colonic lesions, left-sided colonic lesions, the presence of an underlying semilunar fold, and a less-experienced endoscopist. Colonic lesion was the only independent predictor among less-experienced endoscopists, although marginally significant for experienced endoscopists. 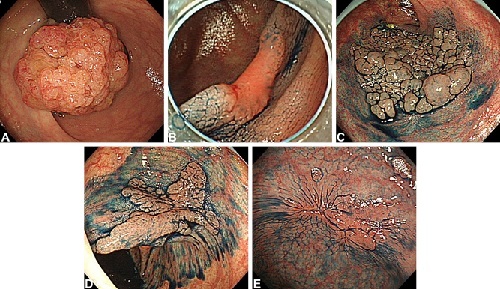 For colonic lesions, the presence of fold convergence, poor endoscope operability, a less-experienced endoscopist, and the presence of an underlying semilunar fold were identified predictors. Our results support the strategy of beginning colorectal ESD training with rectal lesions. When less-experienced endoscopists move from rectal lesions to colonic lesions, colonic lesions without identified predictors should be preferred. A prospective study for validation of these predictors is warranted. Endoscopic appearances of the defined findings. A, Semilunar fold. B, Fold convergence.